Landmark Font Features: Perceptual Shading | Hoefler & Co.
What appear to be simple outlines and shadows belie a vast effort to conceal and correct optical illusions — far more than what’s easily achieved in a drawing program. The eye perceives horizontal strokes as thicker than vertical ones. Type designers compensate for this phenomenon by thinning down horizontal gestures, which they can do with surprising latitude. In a typeface like Landmark, where the contrast between thicks and thins is meant to be slightly palpable, horizontal strokes are just four-fifths as thick as vertical ones. 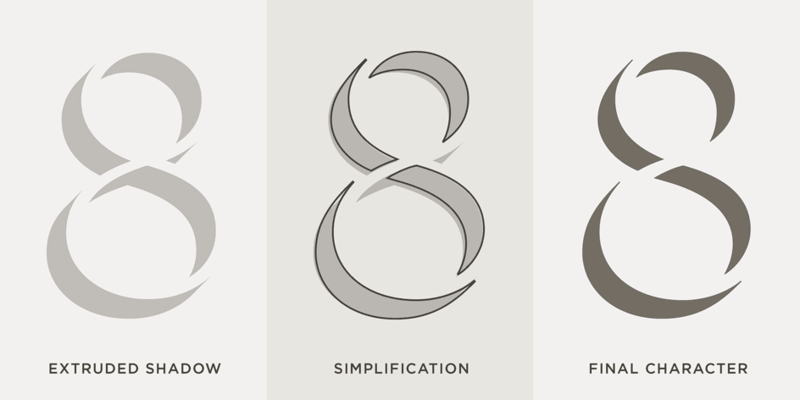 While a letterform drawn by a designer will exhibit this necessary contrast, a drop shadow that’s derived by mathematics will not. Projecting this capital H diagonally downward creates a shadow with equal horizontal and vertical dimensions, creating the illusion that horizontal strokes are thicker than vertical ones. The resulting discord between light and dark creates a visible disturbance when letters are assembled into words and paragraphs. 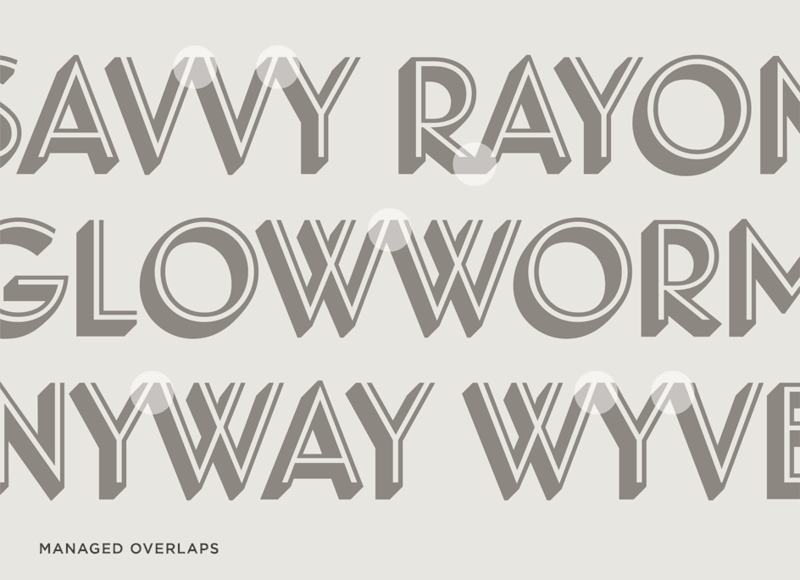 Landmark applies typographic conventions to its drop shadows, shifting weight between horizontal and vertical strokes to achieve a more even color, while preserving the traditional 45° bevel. This technique is not limited to orthogonal lines: some of the design’s biggest challenges are in its diagonal characters such as W and 4, and its curved characters such as S and &. 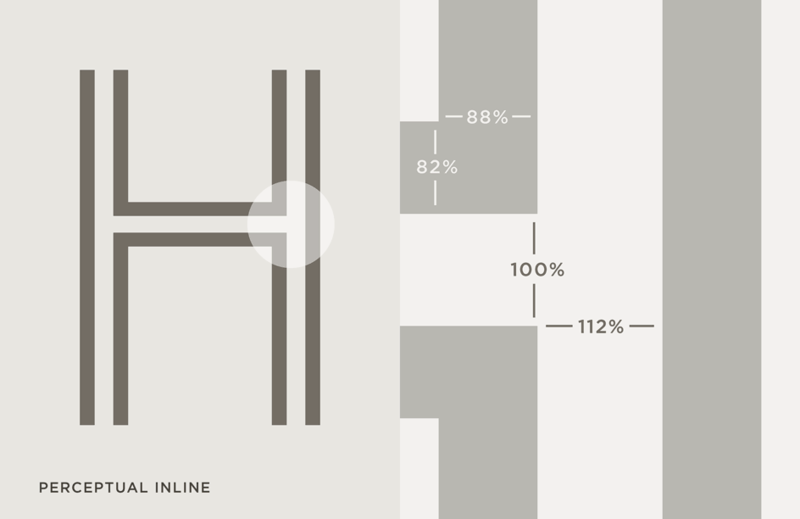 Varying the weight of a stroke based on its orientation creates extra complications with an inline face, in which there are both white inlines and black outlines to contend with. In the Landmark Inline typeface, both the printing and non-printing areas have been adjusted to give them optical parity, requiring four different measurements to give the impression of one. 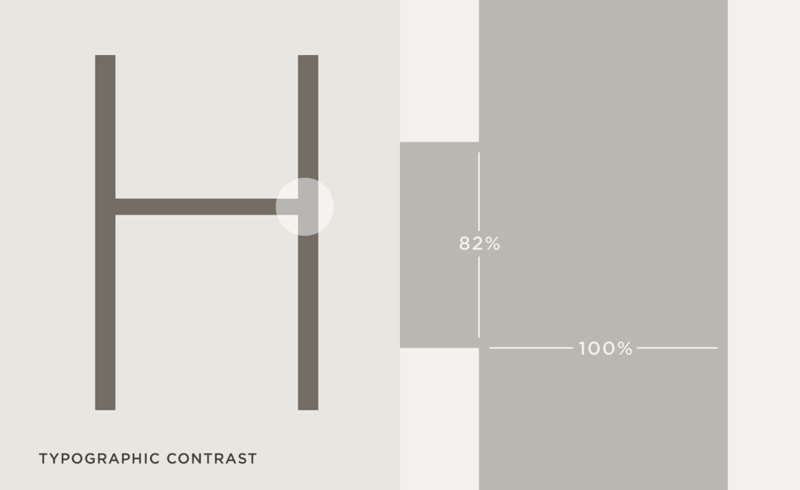 Keeping the “light” at a consistent angle can produce successful illusions, but it can also impair legibility. Gestures oriented toward the light source, like the upper arm of this K, cast barely a shadow at all; those at right angles to the light, like the lower arm, cast too deep a shadow. 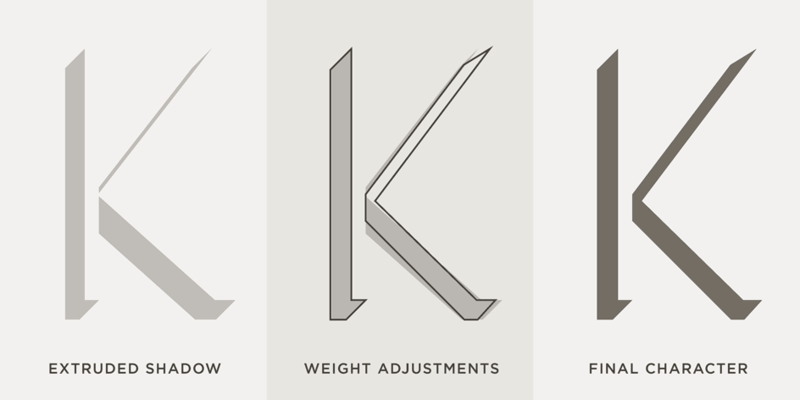 The Landmark Shadow typeface reapportions the mass of these strokes to more clearly define the underlying letter, to imply a consistent depth, and to temper any extreme variations of weight. Mathematically extruded shadows are full of tiny fragments, like the splinter on the right side of this figure 8. At small sizes these shards can vanish; at large sizes, they are simply unattractive. Removing them involves revisiting other parts of the character, in this case the shadow on the upper edge of the lower counter. Often these adjustments end with rebalancing the character by reshaping every one of its contours. Balanced shapes rarely cast balanced shadows. 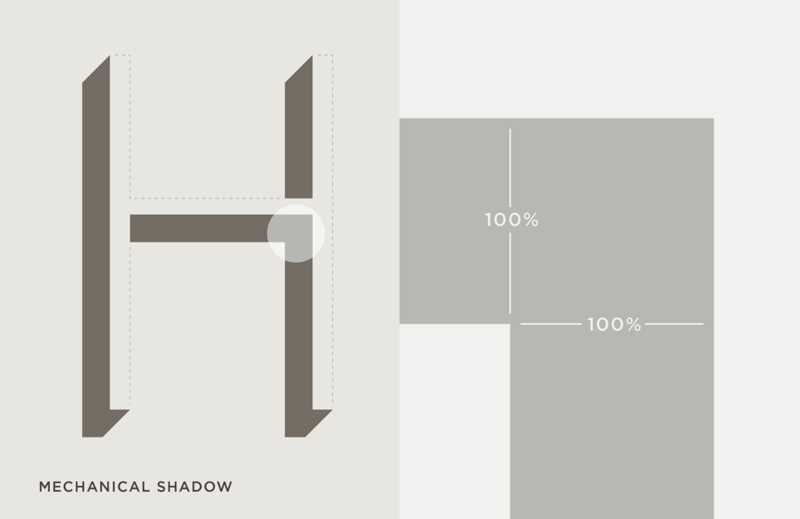 In characters whose identity is defined by symmetry, it’s often necessary to redesign the character itself in order to favor the shadow that it casts. At left, Landmark’s five-spoked asterisk catches the light from different angles, producing a jarring rhythm of light and dark shadows. At right, a shadowed asterisk drawn to imply a six-spoked form, with clearer definition and more even color. Most surprising in Landmark were the quotation marks, whose contrary motion creates shadows that are dark in one direction and light in the other. Creating characters in Landmark Shadow that feel symmetrical required rethinking their underlying forms, which in actuality no longer match one another in weight, length, or angle. Tiny floating accents are among the glyphs most susceptible to distortion when shaded. Above, a circumflex, caron, and breve, shown at left with their mathematically-derived drop shadows. The correspondence between the upward circumflex and the downward caron has been lost, and the angular caron is now easily confused with the rounded breve below. In Landmark Shadow, we distorted the underlying shapes in order to favor shadows that are more clearly distinguishable from one another, and more compatible with the alphabet. A typeface which inherits all the difficulties of both shadowed and inlined alphabets poses an additional challenge: characters that collide. In the Landmark Dimensional typeface, an OpenType feature automatically substitutes alternate forms that have been specially drawn to resolve disputes between neighboring characters. 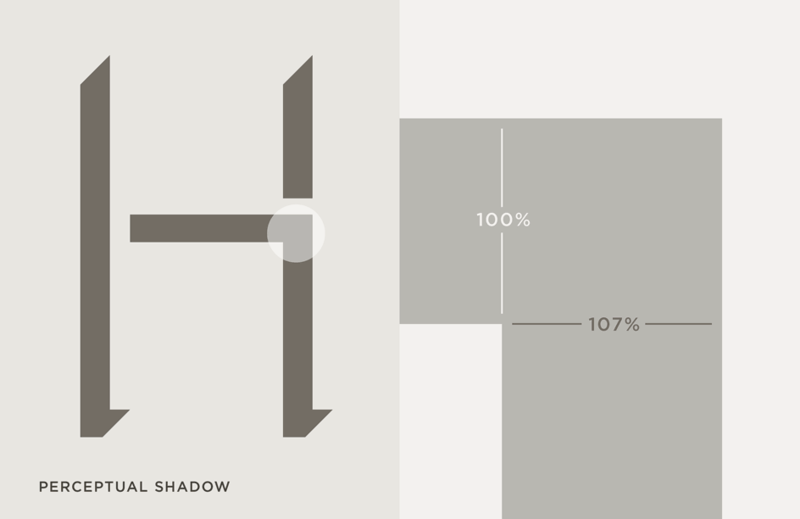 These prevent shadows from overlapping inlines (as in W W), and fill cracks between nearly parallel edges (as in R A). Four Styles. The Landmark family is a central theme with three variations inspired by physical artifacts: an Inline, a Shadow, and a Dimensional style. Dynamic Capitals. Originally designed for building signage, Landmark uses strategies that help make capital words especially engaging and vigorous. Perceptual Shading. Landmark’s shadows and inlines take every opportunity to outwit the side effects of mechanical distortion. Language Support. Landmark features our Latin-X™ character set, covering more than 140 languages throughout the world — including all of Central Europe.